Ionic in style, with a tetrastyla portico and wings, this fine building was gifted to the town by the late Sir Peter Coats of Woodside. Originally £15,000 was expended on the structure, which was handed by the donor to the town, on condition that the Free Library Act was adopted. It was opened for public use in 1871. A few years after this it was found that the building was very inadequate for the increasing demands on its usefulness. 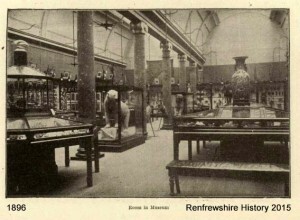 With his usual liberality, Sir Peter Coats came forward to supply this, and in 1880 he proposed, at his own expense, to make an addition to the Lending Library, to give a more commodious room for the Reference Library; to make a large addition to the Museum, with a Sculpture Room and Picture Gallery. This handsome addition was opened in 1882. In the Libraries there are over 25,000 volumes of standard literature, 7000 of which were received from the old Paisley Library, which was founded in 1802, and ceased to exist when the Free Library was opened. 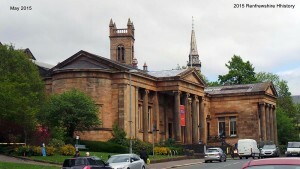 The Reference Library contains over 6000 volumes, 5000 of these having been presented by the Paisley Philosophical Society, which was established in 1806. Both libraries have been extensively patronised from their foundation onwards, and their influence for good on the community has been incalculable. The Museum is rich in Natural History, in relics of the Past, and in specimens of Industrial Arts of the town and country generally. In every respect the Institution is one of singular completeness, and the visitor is strongly recommended to make acquaintance with its Natural History, Antiquarian, Artistic and Industrial treasures. The free library and museum were very popular, so much so that the building again outgrew the extensions add by Peter Clark. The new extension, designed by the firm of Honeyman, Keppie and Mackintosh. It cost £7,000 which was donated by James Coats, son of Peter Coats. 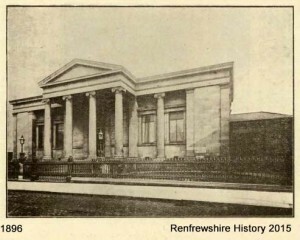 The extension was designed with a narrower version of the original temple front of what is now the museumand opened in 1904.